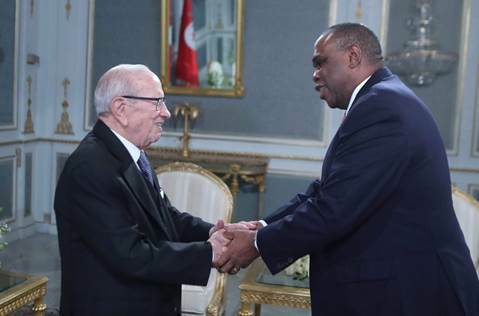 Afreximbank President Prof. Benedict Oramah (right) in handshake with President Beji Caid Essebsi of Tunisia during their meeting in Tunis. Tunis, 05 Feb. 2019: – The African Export-Import Bank (Afreximbank) is to implement a Tunisia-Africa Trade and Investment Promotion Programme (TATIPP) with an initial commitment of $500 million to promote trade between Tunisia and the rest of Africa, Prof. Benedict Oramah, President of the Bank, has announced. Speaking in Tunis yesterday during a meeting with President Beji Caid Essebsi of Tunisia, Prof. Oramah said that TATIPP, whose structure would be similar to the programmes being implemented with Egypt, South Africa and Nigeria, would provide special risk cover for Tunisia’s trade with the rest of Africa. The programme would also provide financing to Tunisian companies engaged in trade with other African countries and support others to retool with the view to improving their competitiveness in Africa and globally, he added. Prof. Oramah said that if the initial commitment was fully utilized, Afreximbank would be prepared to increase the amount available. He noted that Afreximbank was already supporting a number of Tunisian businesses, such as the Loukil Group, in their investments and business undertakings in other African countries. Responding, President Essebsi commended Afreximbank for introducing TATIPP and expressed the country’s full support for the programme. He pledged policy support to facilitate the smooth implementation/rollout of a programme that had the potential to deepen trade and economic cooperation between Tunisia and other African countries. Also yesterday, Prof. Oramah met with Youssef Chahed, Prime Minister of Tunisia, telling him that, in addition to the $500-million TATIPP, Afreximbank had approved facilities worth $300 million for six Tunisian banks under its Afreximbank Trade Facilitation Programme (AFTRAF). AFTRAF is structured to enhance confidence of counterparties in the settlement of international trade transactions, support intra-African trade and facilitate purchase of equipment for production of export goods. It was developed in response to the cutbacks in trade finance available to Africa due to stringent compliance and regulatory requirements imposed on international banks. Prof. Oramah said that TATIPP could yield substantial benefits to Tunisia as the country had the necessary requirements for a successful implementation, noting that the programme implemented with Egypt ended up supporting a large percentage of that country’s trade with other African countries. He announced that the Bank was considering to reopen its Tunis-based regional office for the Maghreb Region to revive trade flows between North Africa and the rest of the continent within the framework of the recently-launched African Continental Free Trade Agreement (AfCFTA). Prime Minister Chahed said that Tunisia was ready to create an enabling environment for the Bank to operate successfully in the country. Tunisia had been very Africa-oriented in the past and was keen to return to that mode, he said, noting that the country had a visa-free policy toward many African countries and was providing educational support to many countries. Prof. Oramah is leading an Afreximbank delegation which is in Tunis to participate in the two-day Financing Investment and Trade in Africa conference being hosted by the Tunisia-Africa Business Council from 5 to 6 February.